We traveled to Roanoke, Virginia this past weekend. Nick’s cousins were running the Hokie Half Marathon and we thought it would be a fun visit if I signed up for the 5k and ran that morning too! It was gorgeous weather and I was really excited to bring Austin to his first race. Nick and Austin waited at the finish line and cheered for me. It was the cutest thing ever.My time was better than I thought it would be. I’m not a fast runner and my average 5k before Austin was usually around 32 mins, so 38 mins isn’t terrible. I plan to sign up for a 10k at the end of this month as well to keep up the momentum. I gained 45lbs when I was pregnant with Austin. At 3.5 months postpartum I have about 15 lbs to lose still. We totally carbo loaded the night before. 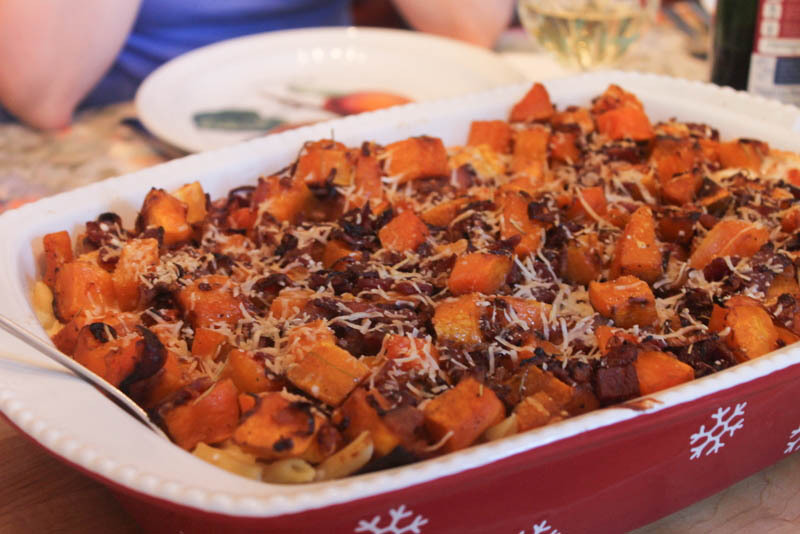 Nick’s Aunt Jennifer made this “Roasted Butternut Squash and Bacon Pasta”. Roasted Butternut Squash. Bacon. Pasta. Yum. There is something about all of those words together that sounds like heaven. Maybe it’s the word “butter” paired with “bacon”. Jennifer made a vegetarian version as well. She used mushrooms instead of bacon and was still amazing! Austin got a jumper while we were visiting. His cousin Avery is about 8 months older than him so we get to take advantage of some of their “keep this until we need it again” toys. I think he likes it… what do you think? Avery’s parents Christie and Sam have a awesome blog called Brewyourownium (so cool) and we got to try some of the very last bottles of their award winning stout and saison. I have been drinking more beer lately (the alcohol content is less than wine which I like since I am still nursing). I have to admit I really like cider though. Which isn’t really beer is it? Running races, eating bacon pasta, playing with babies and drinking good beer. I could get used to this. 2. Combine 1/4 teaspoon salt, rosemary, and pepper. Place squash on a foil-lined baking sheet coated with cooking spray; sprinkle with salt mixture. Bake at 425° for 45 minutes or until tender and lightly browned. 3. Cook the bacon in a large nonstick skillet over medium heat until crisp. Remove bacon from pan, reserving 1 1/2 teaspoons drippings in pan; crumble bacon. Increase heat to medium-high. Add shallots to pan; sauté 8 minutes or until tender. Combine squash mixture, bacon, and shallots; set aside. 4. Cook pasta according to the package directions, omitting salt and fat. Drain well. 5. Combine flour and 1/2 teaspoon salt in a Dutch oven over medium-high heat. Gradually add milk, stirring constantly with a whisk; bring to a boil. Cook 1 minute or until slightly thick, stirring constantly. Remove from heat. Add provolone, stirring until cheese melts. Add pasta to cheese mixture, tossing well to combine. Spoon pasta mixture into an 11 x 7-inch baking dish lightly coated with cooking spray; top with squash mixture. Sprinkle evenly with Parmesan cheese. Bake at 450° for 10 minutes or until cheese melts and begins to brown. ***Notes from Aunt Jennifer***: Important to use SHARP provolone. It will be bland if you use regular provolone. Not necessary to cook the shallots in the bacon grease. If you cook your bacon in the microwave like we do, you can saute your shallots with a little bit of olive oil. Congrats on your first post baby 5k! I’m training for my first ever 10k and I’m excited! Their home brews look good! Glad you enjoyed the beers, Michelle! I think the delicious, delicious carb-loading definitely helped power all of us through race day. For a bunch of new mamas and first-time racers, we all put up some pretty amazing times! +ACI-I just hear the departures are going to be fantastic +lR8-?these beautiful jets departing one after another,+ACI- Ferrara said. Brady would miss the season’s showcase kickoff game on Sept. 10 against Pittsburgh, then Week 2 at Buffalo, a home game against Jacksonville and +lR8-?after a bye +lR8-?a game at Dallas in Week 5. He will return the +AFs-url+AD0-http://www.jerseysnflchina.us.com/+AF0-NFL Jerseys From China+AFs-/url+AF0- week of a Patriots-Colts +AFs-url+AD0-http://www.cheapstansmithonline.com/+AF0-Adidas Stan Smith Shoes Cheap+AFs-/url+AF0- AFC championship rematch in Indianapolis. Nixon appointed a two-man task force to lead a St. Louis stadium effort to counter an +AFs-url+AD0-http://www.cheapnikeshoesfromchina.us.com/+AF0-Nike Shoes Online Sale+AFs-/url+AF0- attempt by Rams owner Stan Kroenke (KRON’-key) to move the team to a new stadium in the +AFs-url+AD0-http://www.chinacheapnfljerseys.us.com/+AF0-Jerseys NFL Cheap+AFs-/url+AF0- Los Angeles area. The lawsuit also says the league can’t punish Brady for violating standards that didn’t exist: Because the league had no standard procedure for testing the air pressure in footballs, there’s no way punishments can be +AFs-url+AD0-http://www.jerseyscheap.cc/+AF0-Discount NFL Jerseys+AFs-/url+AF0- +AFs-url+AD0-http://www.cheapshoesfromchina.us.com/+AF0-Cheap Shoes From China Free Shipping+AFs-/url+AF0- fair and consistent, as required. Now Guion’s future is murky with one of the league’s model franchises. A big reason for Hoyer’s success on Sunday was the +AFs-url+AD0-http://www.officialmlbfanstore.com/Boston-Red-Sox-Cyber-Monday-Bill-Lee-Jersey-Black-Friday/+AF0-Bill Lee Jersey+AFs-/url+AF0- continued strong play of DeAndre Hopkins, who leads the NFL with 726 yards receiving. He had 10 receptions for +AFs-url+AD0-http://www.nflchinacheapjerseys.us.com/+AF0-wholesale jerseys china+AFs-/url+AF0- 148 yards against Jacksonville to become the first player in NFL history to have at least +AFs-url+AD0-http://www.airmax90australiacheap.com/+AF0-Cheap Air Max 90 Australia+AFs-/url+AF0- nine catches and 145 yards receiving in three straight games. I just want to say I am just all new to weblog and absolutely liked this web-site. More than likely I’m planning to bookmark your site . You definitely come with very good articles and reviews. Thanks a lot for sharing with us your blog. What is the most effective method to search for blog sites you have an interest in? FLteiZ news How to stop importing blog posts on facebook? аАааАТаЂТStop importing a button is not found. ?